David Parer brings us the fruits of his labour in this fascinating wildlife documentary on the native Australian marsupial the platypus. �A creature with webbed feet like a frog, a bill like a duck and venom like a snake, and oddest of all, it lays eggs like a bird.� Three years in the making we delve into the life of this unique mammal. David pursues the platypus down the East Coast of Australia with the help of fellow minded wildlife observers filming the various habits and habitats along the way. As the creature spends most of it�s life underwater and underground David uses the latest technology of micro cameras and infra red to follow the platypus within their burrows and at night. The scenery is breathtaking especially within the remote Tasmanian wilderness and rainforests where platypuses are still plentiful, feeding on larva and insects. We see their social structure, mating rituals and territorial battles between rival males. Their interaction with other creatures, the pushy sea bird is noteworthy as it pecks the platypus to dig up the sea floor so it can pilfer the goodies beneath. Platypus comes from the Greek for �flat footed� and has changed little from the time of the dinosaurs. We look at a close relative briefly in the echidna as well. 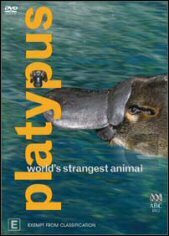 A fascinating and passionate documentary that gives great insight into Australia�s native platypus highly recommended for wildlife buffs. The hard work involved in bringing this creature to life is to be commended. Well worth a look and great educational material for schools. DVD visual transfer is crisp and pleasing in a 16X9 anamorphic transfer (widescreen) presentation. Audio is in Dolby Digital 2.0 and has a clear mix although it is primarily a dialogue driven soundtrack. Extras include a photo gallery and an extra documentary called Bobby and the Banded Stills exploring the life of this inland bird, often referred to as an Australian flamingo. This is in 4:3 aspect ratio.